As with all facets of mixing and recording, the source sounds are paramount. Choosing the best reverb(s) for the job up front will ultimately determine the end result. So, even before we get into the mixing of the space, let’s talk about sound selection. In a musical piece, we can treat the reverb as any other sound source, with four basic components: rhythm, volume, tone and texture. One of the key elements of any reverb is it’s decay. The length of the tail is often an indication of the expanse of the space. However, it also determines the time in which the reflections sustain in the mix — and that’s a rhythmic consideration. A long sustaining sound in a fast tempo (or rhythmically complex) piece is going to mask elements of the mix and generally slur the overall rhythm. A fast decaying tail in a slow piece on the other hand will leave a lot of empty space with very little impact from the reverb. Find a tail length that compliments the speed of the piece. Another rhythmic consideration is the speed of the pre-delay. 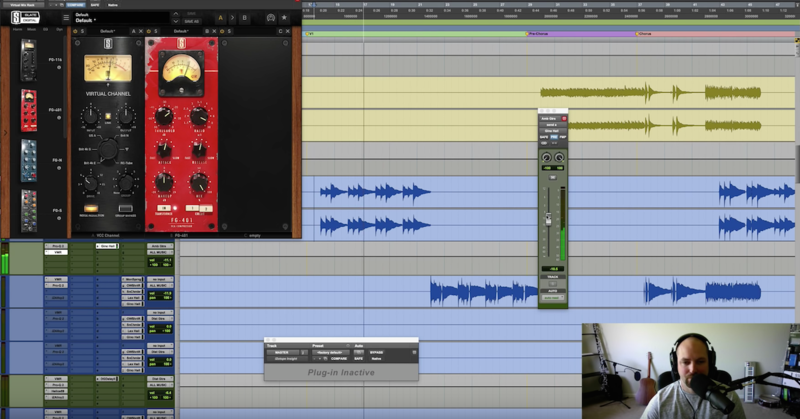 Pre-delay is a key element in determining the front-to-back relationship of the dry sound and the space it exists in. In other words, pre-delay helps the ear recognize how close or far the dry sound is. Generally speaking, the longer the pre-delay, the closer the dry sound. A zero millisecond pre-delay means that the reflections and the dry sound are reaching the ear simultaneously — which puts the dry sound far away. This acoustic phenomenon could be an article all to itself, but we’ll leave it at that for now. Pre-delay is also a rhythmic element. It determines a space of time from the initial dry sound before the early reflections show up. Anything within the Haas Zone (10ms or less), isn’t going to have much effect on the rhythmic sense of the sound. Once you start getting up to 20ms or more, the slap-back effect becomes distinct and there’s a clear rhythmic effect. Find a pre-delay that compliments the speed or rhythm of the piece. Lastly, some reverbs (particularly room and hall style reverbs) have a rhythmic space between the early reflections and late reflections. This is not always controllable, but listening for that “bulky” moment in the reverb sound is important when selecting reverb. Often times, plates are a good choice for drums, partially because there are no “early” or “late” reflections — eliminating that particular rhythmic concern. 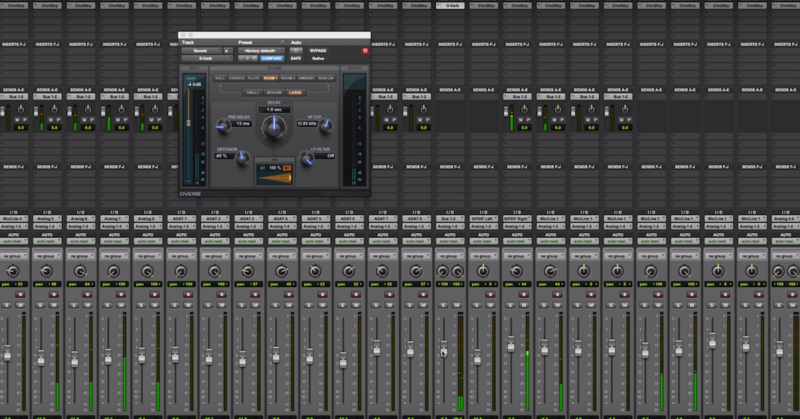 Generally, when I’m mixing, I prefer just enough reverb to add a little life to the elements in the mix. Often, I’m setting my reverbs 15 or 20 dBFS lower than my dry elements. However, this isn’t to say reverbs can’t come to the foreground. It’s a very important aesthetic decision. Just remember that whether the reverbs are subtle or prominent, they still need to sound right. This is where we get into the gritty stuff. There are many factors in determining the tone and texture of a reverb. First comes the style of the algorithm or convolution, then the three D’s: diffusion, density, and damping. Springs and Plates — A transducer sends vibrations across a metal coil, which are then picked up by another transducer. Springs have a “rigid” texture and a hollow tone. Certain frequencies will jump more than others. Plates use a similar system, but work around vibrating metal plates. The result is a more natural sound, but one which is often “denser” than a real space. Plates will also highlight certain frequencies. The exact tonal qualities will vary to some degree in spring reverbs, and to a greater degree in plates. One major tonal difference is that plates tend to be “shinier” than springs, which feel more “empty” or “lonely” if those words can even apply to sound. Vibrations appear immediately and decay linearly — there are no early or late reflections. Because of these things, plates and springs are often very distinct and forward sounding reverbs. Very useful for adding firmness or punch to the elements that feed them. Chambers, Halls and Rooms — Hall and room reverbs simulate the way a sound would actually act in a given space. The characteristic sounds will change distinctly from unit to unit. Rooms are often based on rectangular or semi-rectangular level spaces. Halls are often modeled off amphitheater designs with curvature to the walls and incline from the sound source. Halls will usually have less separation between the early and late reflections. Otherwise, the algorithms are generally based around a size approximation. Halls are designed to be vast and deep. Rooms are designed to be more natural. Halls will have a more even tone, whereas rooms may have resonant peaks and dips — but this is entirely dependent on the particular reverb unit. Chambers are unique room designs, and will vary as often as actual reverb chambers will vary. Many reverbs, especially the “natural” space algorithms also may have settings for diffusion, density and damping. The interior of a big, empty oil drum will have almost no diffusion. The boundaries are smooth and evenly proportioned. Meanwhile, a dense forest would be extremely diffusive — all the reflection points are angular and rough and randomly proportioned to one another. Spaces tend to sound deeper when there is more diffusion, as echoes will scatter more each time they reflect off the boundaries. Be aware that different reverb units will create a more diffuse sound when the diffusion is set higher, and some will create a less diffuse sound when the diffusion is set higher (confusing, right?). Damping refers to the absorptive properties of the space. Damping is non-linear across the frequency spectrum. Every material has it’s own damping properties, however, most reverb processors allow for at least some control over the high damping. Sheet rock and metal have very minimal damping, and tend to sound bright and ringy. Brick and wood have a medium amount of damping, often making them a choice material in spaces. Rooms overly treated with absorptive materials such as fiberglass or acoustic foam have a great deal of damping and can often sound dark. Tone wise, damping will reflect how long the high-end of the reverb stays present during the decay. Density refers to the number of reflections over a given increment of time. Plates tend to be naturally dense as the actual resonance is very fast — whereas springs tend to be much less dense. Lower densities tend to reveal a “ripply” quality in the reverb (for better or worse), and this will be most apparent in short transient sounds (drums and anything else played staccato). This is definitely a lot of information to absorb (pun completely intended). Read, re-read, and play with different settings on your reverb units and note the results. Be discerning — the rhythmic, tonal, and textural choices are equivalent to choosing guitar amp settings or drum tunings. If chosen wisely, the mix will be easy, if not, you’re in for an uphill battle.